Every critic reviewing Star Wars should open with an honest disclosure of the degree to which their heart is accountable to their head. So here is mine: I’m a Star Wars person. I go in wanting to love it. I’m also a Christmas person, and I don’t think it’s a coincidence that there is a high degree of overlap between fans of the two institutions (though the point at which they literally meet, the Star Wars Christmas Special, is one of pop culture’s most univerally reviled artifacts). Despite my affinity, I don’t hold it against people for whom neither Santa nor Vader ring any emotional bells. To enjoy either it helps to have grown up with them, to have a high appreciation for camp, a high tolerance for commercialism, and a sophisticated ability to discard the bad in favor of embracing the good. (I will ignore a thousand saccharine Christmas carols and an entire trilogy in order to hang on to my loves.) Imperfect though they both are, Stat Wars and Christmas are also two of the only cultural institutions big enough to unite broad swathes of people, offering as they do a vague philosophy of hope, of light held against darkness, in comforting and affirming repetition. I was afraid that neither the Christmas nor the Star Wars spirit would find me this year, given everything. Even without the crushing forces of authoritarianism bearing down on us, it just doesn’t always work. The colors can be too bright, the cheer too forced, the greedy hands churning out the merchandise too difficult to ignore. But I’m happy to report that I’m writing this fully, willingly, and gratefully under the spell of both Christmas and Rogue One. What follows is going to be packed with spoilers, so consider yourself forewarned. Right from the start, Rogue One positions itself outside the trilogies that preceded it. There’s no text crawl to fill you in on the backstory, the score is the first not to be composed by John Williams (had to happen sometime), and the opening shots are more concerned with the vastness of space than the ships threading their way through the darkness. These differences are all to the good, because Rogue One’scentral message is different from the trilogies, and better suited this moment, as we steel ourselves for the next four years. 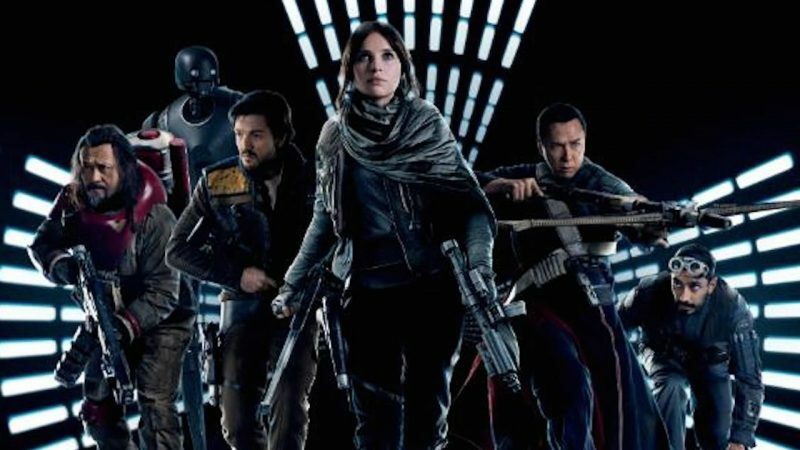 The film’s first half is much weaker than the second, because it is when we are introduced to our characters, and even though they are remarkable, Rogue One isn’t really about them. They are compelling individuals but the film is a reminder of the limits of individualism. Rogue One‘s entire moral universe exists, not in opposition to, but as a complement of the trilogies and their heroes; these are the people who make those heroes possible. Seen in that light, it seems like a clear-eyed choice to make this particular ragtag band of misfits a little gruffer and harder to love than Rey, Fin, and company. That being said, Felicity Jones anchors the film beautifully as Jyn Erso, the moody warrior whose cynicism yearns to give way to belief. I would have believed in her character even without the opening sequence of her as a child, which I would gladly have traded for some of the Forest Whitaker scenes we glimpsed in the trailer but not in the final cut. Regardless, Jyn is a typical Star Wars heroine only insofar as she has the requisite dead mother and estranged father; otherwise she is darker than Rey and Luke (who it is amusing to imagine pouting at the twin sunsets while the action of Rogue One is going on) put together. Jyn is captured by the Rebellion, where we are treated to a hard look at the widely varying tactics and philosphies espoused by its leaders (and the only speaking role by a black woman in the entire film!). Jyn’s guide to The Rebellion is Cassian Andor (Diego Luna), who embodies a messiness we’ve never had to see in any of our true believers before. Luke had his faith in the Force, Han hid behind his charm, and Leia never had to get her hands too dirty. But in his very first scene, Cassian has to murder an ally to protect his mission. The rest of the team is delightful, except the pilot, who is just kind of a strained vocal affect and a haircut. The men who protect the Jedi temple are the movie’s spiritual anchor and deserve more backstory (and I guess can be gay if that makes it better for you), and Saw Gerrera’s whole arc feels oddly truncated, but again: the characters aren’t really the point. What matters is the mission, which is crucial but unglamorous. It’s not “destroy the Death Star,” it’s “steal the plans to enable someone else to destroy the Death Star.” And again and again throughout the movie, what stands in our team’s way is logistics. The satellite has to be repositioned. No one knows what the master switch looks like or where it is. And most relatablly: the goddamn cord isn’t long enough to plug it in. If it weren’t for Alan Tudyk’s masterful voice acting as a deadpan droid to leaven the tension, Rogue One might be overwhelmed by the constant frustrations thrown in the path of our heroes. As it is, he easily steals the show from C-3P0, who makes a brief appearance. Mercifully, there aren’t too many knowing nods back to the original trilogy, but the ones that are there are a mixed bag. Grand Moff Tarkin and Leia’s CGI-rendered heads are painful to look at (one wishes whoever did young Anthony Hopkins in Westworld could have stepped in). On the other hand, catching a glimpse of Darth Vader’s body in the medicine bath is haunting, and another pleasing parallel between Darth and Luke. Ben Mendelsohn’s villainous Director Krennic is intereating in the way he is brought down by his individualistic desire to take all credit for the Death Star, but Mendelsohn’s naturalist acting style sometimes feels a bit out of place, though it’s not his fault he’s playing against the ghost of Peter Cushing. About two-thirds of the way through Rogue One, I turned to my little sister and whispered “none of our dudes are gonna make it.” And they don’t. Not one. But that’s what makes it the right Star Wars for right now. It’s a message to all those who want to join a rebellion, that heroism will be required of us all, not just the major players. You probably won’t be the hero getting a medal draped around your neck, but you may be the hero that made it possible. It is, oddly, the most heartening message Star Wars could give me right now, because it isn’t wrapped in sentimentality. Instead it is: you will die, and your friends will die, and the people you give the Death Star plans to will die too, but that’s okay. Because it’s not about you, except insofar as you are one with The Force. The Force has always been one of the least satisfying elements of the Star Wars universe to me, sometimes a parlor trick, sometimes a vaguely Easter philosophy, frequently a marketing gimmick. But it seemed to mean more this time, when invoked by rebels trusting it, calling on it, and finally joining it. That’s a Christmas carol I can believe in.